Originally published August 19, 2018. The Art of Reinventing Yourself. For me, the fall of 1997 was a time for me to shed what no longer served me. I remember I was getting ready for work, and as I applied my makeup, I was not happy with the person staring back from the mirror. I’d been working for seven years as a radio rep for a group of locally owned stations. From outward appearances, I had it all – a big house, a nice car, a trendy wardrobe and enough disposable income to take several beach trips per year. But on the inside, I was miserable. Corporate radio had changed a lot in the years since I first entered the field. In 1990, stations were mostly owned and operated by somebody who lived in the area. The owner led the sales force and in many cases, the news team, too. The owner was hands-on and responsive to the local community. It sounds hokey by today’s standards, but it was a fun and informative field. In the mid-90s, big media conglomerates started taking over the stations, and everything changed. It became all about bandwidth and buying up properties. These mega groups dangled big dollars in front of local station owners, who sold out and walked off into the sunset with their millions. For employees left behind at the stations, work became a pressure cooker. The new owners often overpaid for the business… say, $5 million for a station with $2 million in advertising revenue … yet employees took the rap when the losses exceeded the profits. My work environment changed dramatically, and not for the better. I often worked 10 hours a day, ignored my husband (we fought a lot), and myself (I gained 30 pounds from stress eating). My big ah-ha moment came when my stepson was visiting for a weekend and raided my kitchen for a snack. He didn’t find much. My cupboards (and refrigerator) were bare, and he proclaimed, “Wow! You guys live like bachelors!” That was a wakeup call! I had been toying with the idea of reinventing myself by starting my own business. I had dreams of a small, boutique advertising agency where I could use my years of experience to help local mom & pop businesses grow. Back in 1997, there were no small ad agencies in town —only big, creative shops that charged huge retainer fees. The business model I planned was unique – I would work from home, keep overhead low, and offer clients exceptional customer service while charging nominal fees with no contracts. I wanted clients to keep me around because I was worth it, not because they were tethered by a legal document. It was a radical concept at the time and many of my friends and family disapproved. Why would I want to leave my safe, secure, high-paying job for the uncertainty of self-employment? It didn’t matter that I had done my research, written a solid business plan and squirreled money away to launch my company. To them, it was risky. I was shocked that others didn’t share my excitement at the positive changes going on in my life! That pretty much summed up the reaction I got, but lucky for me, I am married to my biggest cheerleader, Doug Sabin, who always encourages me to be fearless and take big leaps of faith. “The stewing is worse than the doing”, he likes to say, and with that, I launched Marketing 101, Inc., in 1997. Two decades later, we have evolved into a staff of five talented people, who over the years, have helped dozens of Cleveland area businesses grow, and brought lots of jobs and dollars into our local community. Maybe you’ve been considering a new path…teaching yoga, volunteering at your favorite charity, or launching a new business. Transformation can be a scary thing, but with the right intention, the entire process can serve you as much those around you. In 2011, at the age of 43, I discovered the power of yoga. I first went to yoga for the workout; I wanted to get fit and lose a few pounds. But I kept coming back to the practice because I quickly learned that yoga is not just a work out, it’s a “work in.” Slowly, the negative soundtracks in my head were silenced and those thoughts of unworthiness were replaced with feelings of self-love. As I discovered this new pathway to peace, I recognized it as a means of healing and, being me, I wanted to share it with others. I was toying around with reinventing myself — for the second time! But, hey, as my last email blast proclaimed – YOLO! You only live once, right? Why have only one career your entire working life? Why not reinvent yourself as many times as your heart desires? Especially if your intention serves you as well as the community around you. It’s been several years since my first yoga class. And thanks to the spirit of reinvention, I’m proud of the budding yoga community Soul Stretch has built – not just in Westlake, but also in Catawba. 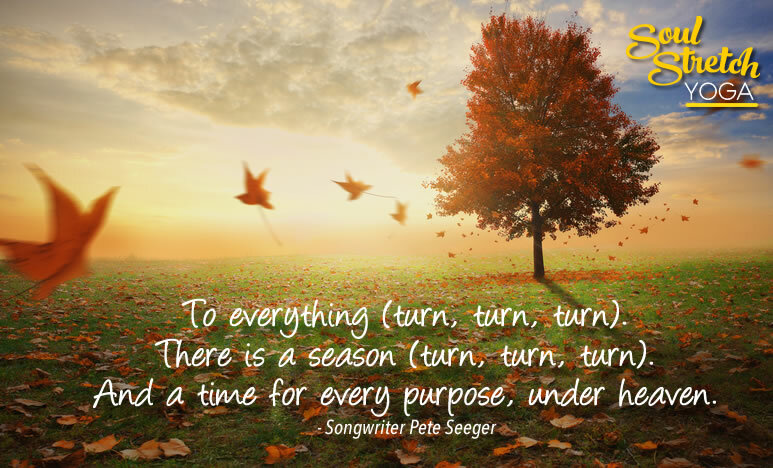 As we enter the season of change, I encourage you to listen to the voice of your own soul (a.k.a. your intuition) and reinvent yourself. Decide on what really excites you and move in that direction. Understand that backlash may be part of the process but move confidently in the direction of your dreams anyway. Remember that it’s totally okay and perfectly normal to be very afraid and very confident all at the same time. Surround yourself with one or two key people who support your vision of reinvention. And most importantly, don’t be afraid to go out on a limb, lovelies, because that’s where the fruit is.